Destination Weddings, Family Reunion Cruises & More! At minimal cost to you, you can operate your own home-based business, set your own hours, be with your own children, and care for other children at home – with Peterson Family Child Care. The FCC staff will train and help you provide responsible, safe, in-home care for children ages 2 weeks to 12 years (including your own children) in your own government home or affiliated off-base home. 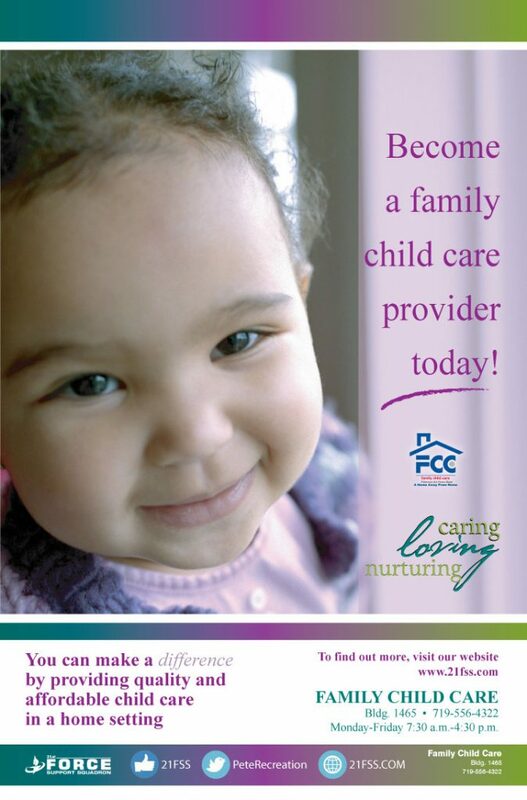 The FCC program is looking for individuals who wish to be child care professionals. You must be over 18 years of age, able to read and speak English, in good mental and physical health, and be willing to undergo a comprehensive background check. After you complete a basic orientation program, you can set your own hours and begin to care for children on an hourly, part-day, full-day or extended basis. As additional benefits, you’ll also receive 60 hours of Air Force standardized training, annual refresher training and be eligible for low-cost insurance options. The FCC program makes it easy for you to nurture and care for children in the friendly, warm environment of your own home. We offer an extensive, free equipment and supply lending program that provides you with everything you need — from forms to outdoor play equipment. The lending program also includes a wide range of child development and safety items such as books, games, toys, safety gates, first-aid kits, electrical outlet covers, cribs, rocking chairs, outdoor play equipment and general supplies. Find out how you can become a child care professional and operate your own business from the comfort and convenience of your own home. Receive the training that will allow you to care for our next generation. Then help support the mission by caring for the children of our military and civilian personnel while establishing a professional career for yourself. Family Child Care is continually recruiting infant care providers. For more information, call the FCC office at 719-556-4322. Tell us: What are we doing well and what do we need to improve? Click here to connect to ICE – and be sure to include your comments. More than anything else, your written comments help us understand what really matters to you. Thank you for caring. Copyright © 2019 Peterson Air Force Base 21st Force Support Squadron. All rights reserved. The appearance of hyperlinks does not constitute endorsement by the U.S. Air Force of non-U.S. Government sites or the information, products, or services contained therein. Although the U.S. Air Force may or may not use these sites as additional distribution channels for Department of Defense information, it does not exercise editorial control over all of the information that you may find at these locations. Such links are provided consistent with the stated purpose of this website.